The Robin Hood Beer Festival: On Target For Food! 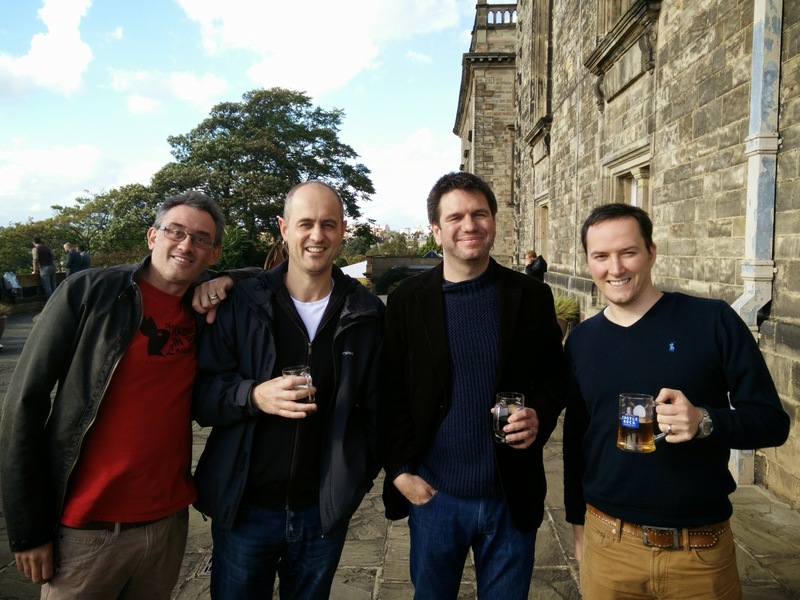 The Robin Hood Beer Festival is a must for any fan of the fine art of brewing. It takes over the grounds of beautiful Nottingham Castle for a long weekend in early October, usually catching the last of the sunshine before England succumbs to the soft rains of autumn. The Festival has been a lock on the Beeranaut's diary for quite a few years now, and 2014 saw a representative quartet (Super Sam, Rev Sherlock, Charmin' Ciaran and myself, El Conojito) jump on the train and hit the Midlands. Now, I could spend a long time raving about the quality and choice of beer on offer, and let's be straight up here: The Robin Hood Festival has a larger selection than any other gathering in the country, and that includes the Great British in Olympia. Given the choice, you should be heading here rather than the big shed in London. The surroundings are nicer, the beer is better and, most importantly, the food is amazing. There'll be plenty of bloggers out there talking about the beer. Me, I'm peckish. Let's take a look at the food. The thing with the Robin Hood Fest is that we're almost more excited about the grub than the beer. We know we're guaranteed a good feed at a reasonable price. We're not talking about duff burgers or a soggy cone of chips here. The scran at Robin Hood is top notch. It never seems long after we head up the hill to the main marquee before we gravitate to the deli stand. It's lunch-time, after all. This is a shared concern between The Cheese Shop, which is normally based in the Flying Horse Arcade in Nottingham itself, and Melton Mowbray's own Mrs. King's Pies. I dream about the porky goodness encased in a lovely crumbly hot-water crust. 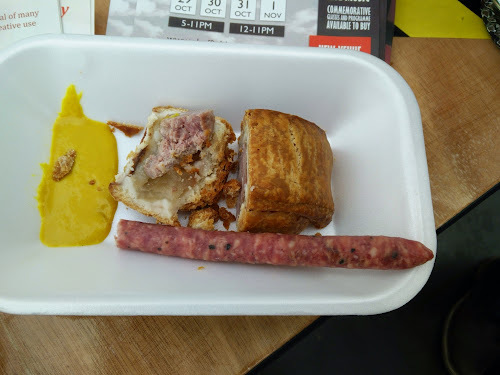 A half-pie with a dab of mustard will set you back £2, and set you up for the afternoon. You will note that greedy Conojito had a salami on the side. Dense, meaty and utterly delightful. Rob's top tip: put a whole pie back to pick up for later, along with some choice cheeses. You have to check out the smoked stilton. While you're picking up treats, head to the Merry Berry stall and snag some chocolate for the significant other. These guys do a roaring trade at the bigger food festivals (they were at Olympia this year) and specialise in creamy buttons and spicy dark chocolate. TLC insists I bring her back the white chocolate with lemongrass. I have a thing for the Scorpion Death Chili Chocolate: absurdly hot, with a burn that just keeps building. Try it, but have a glass of something to hand, because that bad boy is gonna sting. 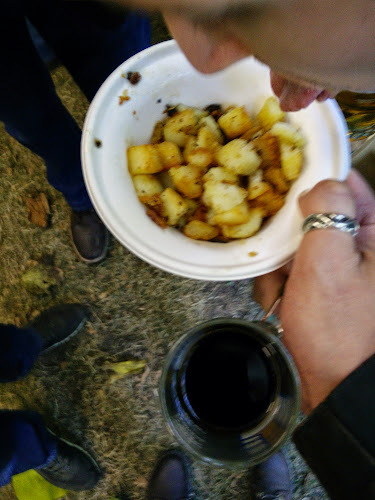 After an afternoon's connosieuring of fine ales, the hunger struck and we Beeranauts wended our way down the hill to the food stands. Tempted as I was by the maple and beer-glazed bacon, something more substantial was needed. Memsaab, a local curry house of distinction, was serving up good grub for the geezer on the go. A heaped punnet of curry and rice was £6 and it was money wisely invested. Beef Madras or Chicken Tikka Masala, both beautifully spiced and fall-apart tender. If you ask nicely, you can have a bit of both. Don't be embarrassed if you feel the urge to lick your tray clean. Lord knows, I wasn't. Memsaab also did amazing wraps of grilled marinaded meat. I had one of those later in the day. Hey, I was hungry. As the sun started to ebb and the crowds started to grow, we knew it was time to vacate the site and find a quiet hostelry. For one thing, we'd been on our feet for six hours. But we needed one last snackie to get us on our way. A bowl of duck fat roasties from the appropriately named Duck Fat Roastie company did the trick. Deeply savoury, crispy, crumbly in the middle, intensely addictive. A big bowl was £3, and was enough for 4 greedy boozy blokes. The scraps at the bottom were the best bits, but the whole thing was deliriously good. Ciaran makes an annexation attempt on the duck fat roasties. He failed. A quiet pint at the Castle Rock Brewery tap by Nottingham's thoughtfully restored train station and we Beeranauts considered the ales of the day. The hits for me were Oakham's Citra (which you can get in M&S, in a slightly rebranded form), Enville's Cherry Blonde, which was the essence of a Cherry Bakewell in a glass, and Nottingham Brewery's own Centurion Porter. But I don't think I had a duff drop all day. Not bad, considering there were over a thousand beers to choose from and I was going purely by instinct. As ever, The Robin Hood Beer Festival was the best of all possible worlds for the discerning Beeranaut: good beer, great food and a fantastic atmosphere in lovely surroundings. It's probably the highlight of my beer year, and its growing popularity shows that I'm not alone. Maybe see some of you there next October? Your Beeranauts: El Conojito, Rev Sherlock, Super Sam, Charmin' Ciaran. Blue skies, great beer.